Protection! Licensing Server - an optional component in Protection! Licensing Toolkit that provides ability to distribute licenses on-demand and to track license's concurrent use according to either Named or to Floating User Licensing Models. Protection! 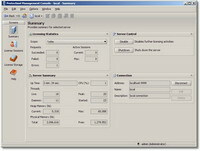 Licensing Server is a complete turnkey solution that can run as a Windows service or as a UNIX daemon and provides full support for Floating and Named User models with ability to manage License lock session's expiration; to host and to distribute an unlimited number of licenses for an unlimited number of products; to allocate licenses for specified users and/or user groups; to control access to the Licensing Server by using access control lists (whitelist and blacklist) for any types of operations; and to remotely monitor and manage the Licensing Server via the supplied Management Console application. 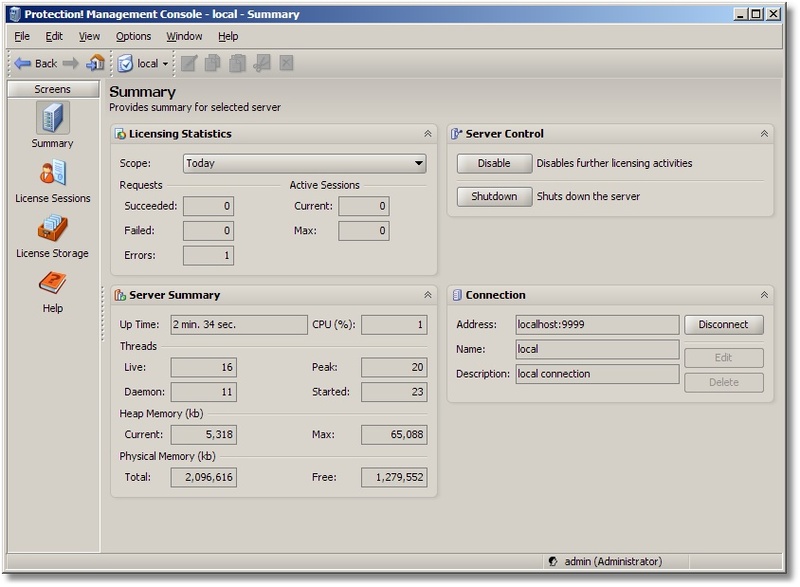 Licensing Server Management Console is a rich GUI application intended for remote monitoring and management of any number of the Licensing Servers. Full support for Floating and Named User licensing models within the local network or over the Internet. Complete control over license distribution and use with ability to revoke given license at will. Zero administration cost (if deployed at the client side). Support for Floating and Named User models by tracking licenses usage by using the concept of the license lock (acquire) and the license unlock (release). Ability to revoke the license lock sessions to force client applications to unlock (release) licenses. License lock session's expiration allowing to correctly release of the license lock when the client application is not responding or the network (connection to the Licensing Server) is down. Ability to host and to distribute an unlimited number of the licenses for an unlimited number of products. Ability to allocate licenses for specified users and/or user groups. Ability to control access to the Licensing Server by using access control lists (whitelist and blacklist) for any type of operations. Ability to remotely monitor and manage the Licensing Server via supplied Management Console application. Authentication and authorization per Licensing Server with ability to maintain the Licensing Server users. Support for multiple Licensing Server connections. Ability to discover running instances of the Licensing Servers via network broadcast. Ability to maintain the access control lists. Ability to view the licensing statistics and the server statistics. Ability to disable/enable any of the licensing activities. Ability to shut down the Licensing Server. Ability to visually monitor current license sessions. Ability to revoke specific license sessions. Ability to maintain licenses storage. Ability to maintain license users/groups. Ability to allocate licenses to the specific users and/or user groups.